These past two weeks have been the first of many things: first flight on American & Australian airlines (previously, I had only traveled on a Mexican airline) and the first time on a different continent. We took one of the longest flights available and traveled to one of the most remote areas on Earth – which was precisely the point of this trip! One would think that this trip would show the vast differences between the U.S. and the ‘Land Down Under’. Yet, I only noticed strong similarities throughout my stay. Our flight over to Perth was akin to traversing the southern California countryside – plenty of discernible ranches with rambling roads along the way. Other than the ‘Australian’ accent, which is not the same in all parts of the country, there aren’t too many disparities in the language. I found the enunciation – with all its diversity – to be pretty awesome. In contrast, it took me quite a while to get used to riding in the left lane – it’s like driving in a mirror image of the road! Throughout the trip, I felt thoroughly welcomed and thrilled to be in a new land – scarcely feeling like a foreigner. America and Australia are indeed siblings in the international spectrum. Another aspect of this trip that I enjoyed quite a lot was the fieldwork. 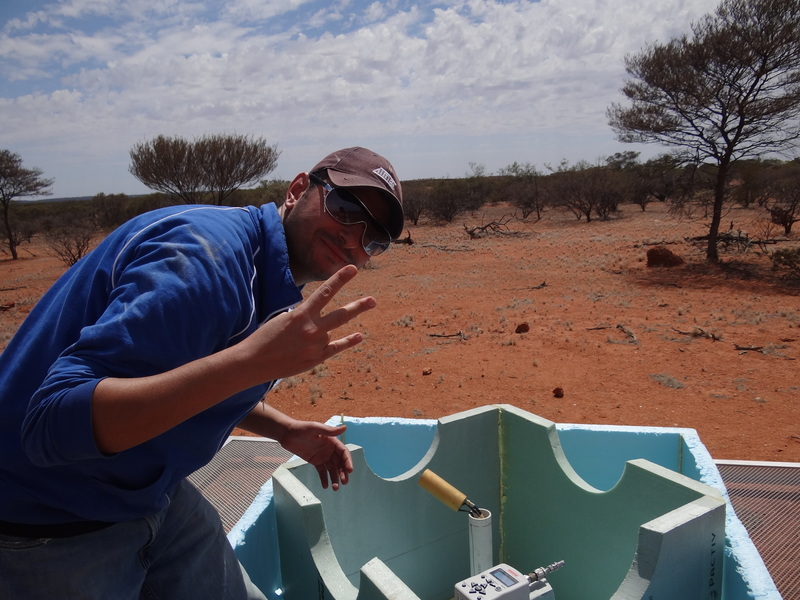 I have found going about the Australian outback, inspecting and mending instrumentation, to be incredibly fun. It’s like playing in a giant sandbox that’s hundreds of square kilometers in size! Yet, whether in the lab or a remote radio quiet zone, once you’re focused on what you’re doing, you quickly lose track of the setting. In the field of astronomy, the entire world – nay, the entire universe – is our lab. Throughout the trip, I have observed the problem solving tactics of the other team members. 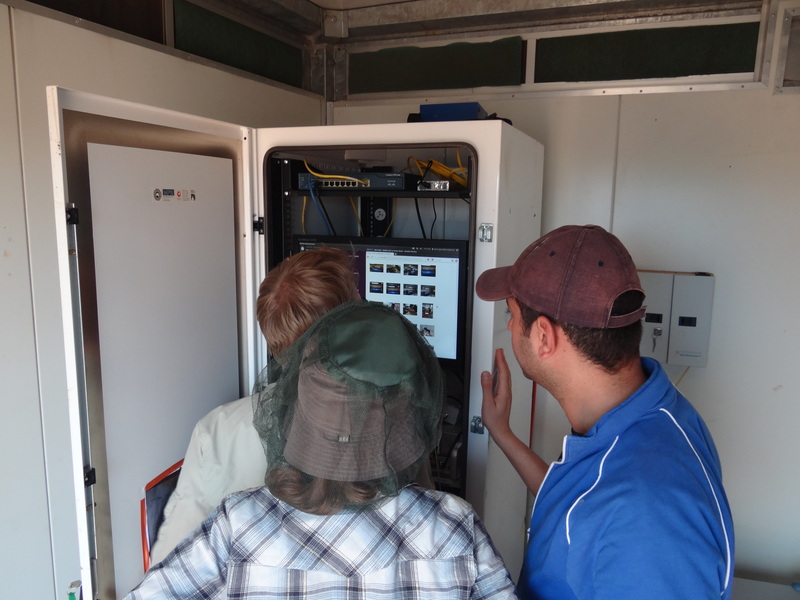 With three PhD’s and a highly experienced technician constantly nearby, there’s always something to be learned. I have noted their pedagogical tips and hope to apply what I’ve learned to tackle new problems. From one west coast to another; a symphony of domestic and international flights, it has been a privilege and a pleasure to be your liaison throughout this trip. Until next time, I hope you may again choose LoCo Airlines to reach your destination. The behemoth that got us to Sydney – Boeing 747. Our onsite LoCo engineer, Mr. Lizard. Always have a notebook handy – whether at the MRO or Mars. The team’s glamour shot. We come in peace! Hamdi is a 24/7 explorer! He creatively MacGyvered his camera to the end of a shoelace and fished a few shots inside a small cave. Don’t get alarmed, it’s just a flying camera riding on a kite. No big deal. Can you spot the emu/s? Oh hey, there’s the Opera House! As we finish our fifth day in Australia, I am set with mixed feelings. On one side, we are essentially done with most of the work that our trip was designated for. On the other, we are a day closer to leaving this amazing country – which feels just like home, sometimes even better. We’ve stopped by the control building and Boolardy Station for the last time. We are extremely thankful for their hospitality and assistance. The food was simply second to none; the staff was extremely supportive and constantly let us borrow equipment (we made sure to hand everything back) while teaching us more about the Australian culture. Lou and I practiced speaking bit of Mandarin on site, I’m sure it had been months since either of us had done so with another speaker. It’s important to note how useful the control building was. It has been, in many ways, our home base. Let’s put it this way, if we were astronauts in near-Earth orbit, it would have been our ISS (International Space Station). After a four hour drive, we arrived at Geraldton. A small resort town, it is right on the coast facing the Indian Ocean. It’s been years since I’ve smelled the salty air; pleasant gusts of wind are constant reminders. I’ve never been in this part of the world, yet it feels awfully familiar. Tomorrow we will depart to Perth and then onto Sydney. Cheers mate! Hello all! Today we woke to another amazing breakfast and headed off to the MWA site. We toured through all the tiles and climbed the nearby breakaway. For the first time in the trip, we finally got some pictures of some kangaroos (or rather, “roos”). We then returned to the DARE/EDGES to take a final view of the set up. Lou, one of the MRO staff, let us borrow a compass which we used to measure the angle of the DARE antenna from North. As he told us, this area has very little magnetic interference which helps us get very accurate measurements. The angle was found to be about 19 degrees off. While part of the time was wrapping things up, Danny and I attached a camera to his kite and took aerial footage of the site. After a couple of failed attempts, we finally got the kite to fly consistently and saved the video. Day 4: It's LoCo Time! G’day mates! It seems like the Australian dialect has finally caught up to me. With most of the fieldwork complete, we reviewed the glorious amounts of data that DARE/EDGES had produced. Nothing alarming came up during the day, so we decided to stay in the homestead and organize our gear for our transit back home. Truth be told, it was quite a good thing to stay in today, given that it was considerably warmer than the previous days. Part of the team went to Mullewa to pick up the new addition, Dr. Danny Jacobs. 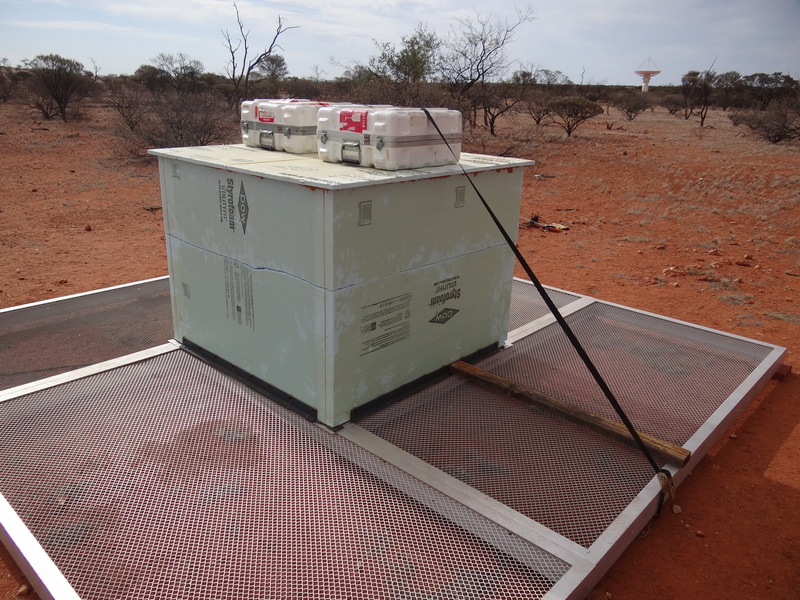 Bringing new energy and supplies (a filter), Dr. Jacobs was promptly updated about the team’s work. We are planning to go out (briefly) to the field again tomorrow. The agenda is to measure the orientation of the DARE and EDGES systems and to run a few more tests on the DARE receiver. It’s important to note about the warning that everyone who visits the MRO will gain weight. Skeptical at first, I would like to conclude that this is in fact, true. Imagine being offered multiple, delicious meals throughout day – there is simply no way to say no. 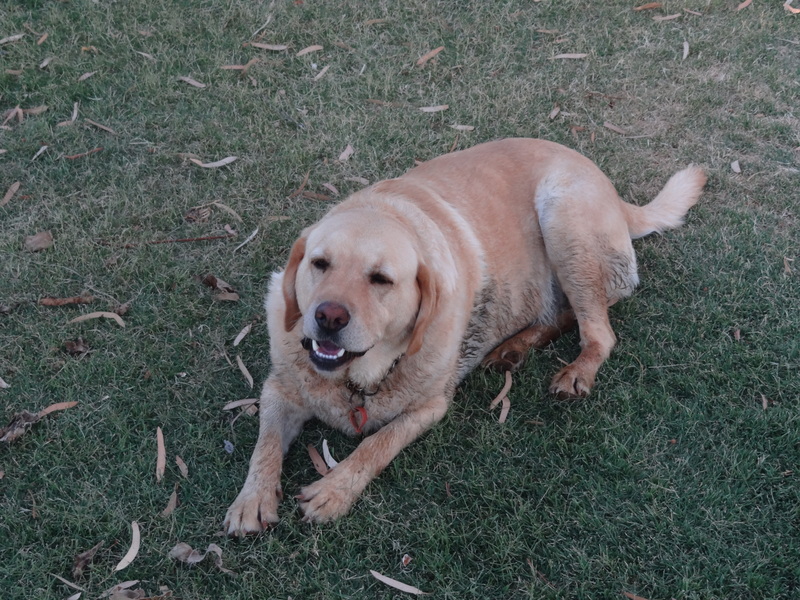 The perfect example is the local yellow lab who has been at Boolardy Station for a few years. He happily trots around the encampment, taking breaks along the way, and nibbling on unidentifiable crumbs. Today will be our last day here, we will depart tomorrow afternoon to Geraldton and onto the MWA meeting. With busy schedules, almost always something on the agenda, and families in different time zones – one often looses track of time. But when asked what time it is, we respond: “It’s LoCo time here!”. 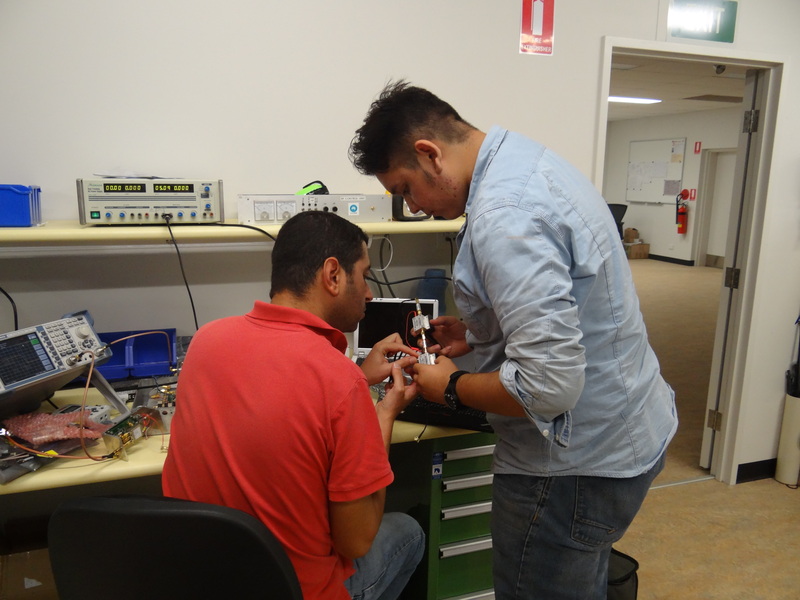 Hamdi and I focused on running a few tests on EDGES, starting off by measuring the impedance. We had to layout what seemed like elvish rope’s (Lord of Rings reference anyone?) worth of Australian extensions cables between the hut and the antenna. In order to weatherproof the antenna, the team thriftily covered the receiver with a plastic bag and laid down an adhesive cover across the upper slits of the antenna. With this complete, we took a sample of the spectrum and verified it looked comparable to a previous measurement. Oddly enough, being able to see just a little RFI helped us validate the spectrum measurement again. Spotting one of these man-made signals is a reassuring token that the antenna is functioning properly. For example, occasionally detecting a spike around 120 MHz means that an airplane might be flying overhead. With this healthy indication, the team left EDGES recording overnight. The B squad directed their efforts to fortify DARE. They had to make efficient use of the glue on hand, carefully positioning glue pellets along the along the walls. Even the distinctive “scarred” side of the enclosure seemed to have healed well. Not a field for the faint of heart, radio instrumentation sometimes proves injurious for interloping spiders and foam boxes. Having received positive results and stabilized the devices, the team drove back to the homestead with a considerable weight off its shoulders and off the truck bed, literally. We had less stuff to take with us – not as much to worry about. Depending on the quality of data, we might not return to the site tomorrow and instead spend time analyzing the data. All indications suggests that both experiments are being team players and producing splendid results. Rested and washed up, we had an amazing roast beef for dinner. Complete with a side of bread, non-skinned potatoes, peas, and squash – a feast for champions. Moreover, Hamdi finally caught up with his daily consumption of butter. Slowly but surely, he conquered the golden cube – the reward of a day’s hard work. 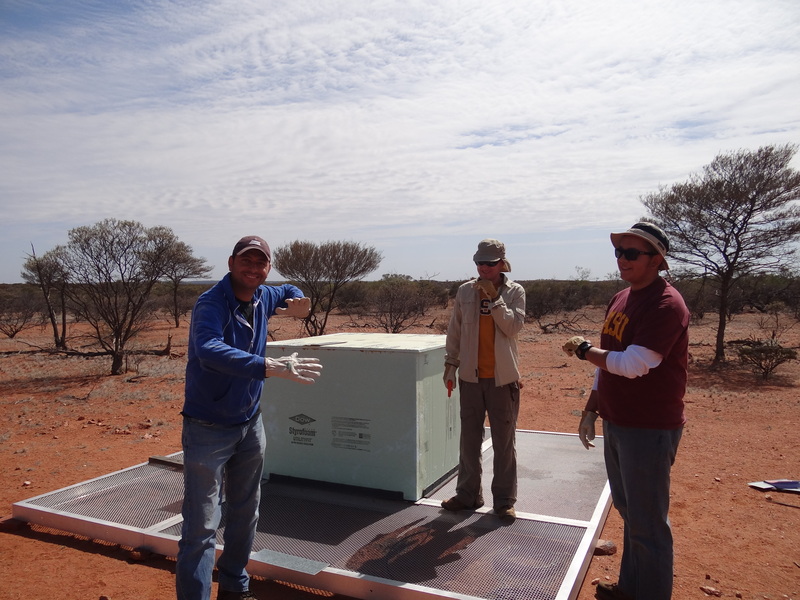 On day three of this journey, the strategy was to place the DARE antenna back inside the foam box. Sure enough, as soon as we had placed the antenna back on the foam supports, Hamdi noticed that one of the antenna terminals was broken. This meant that we needed to re-solder the joint together. 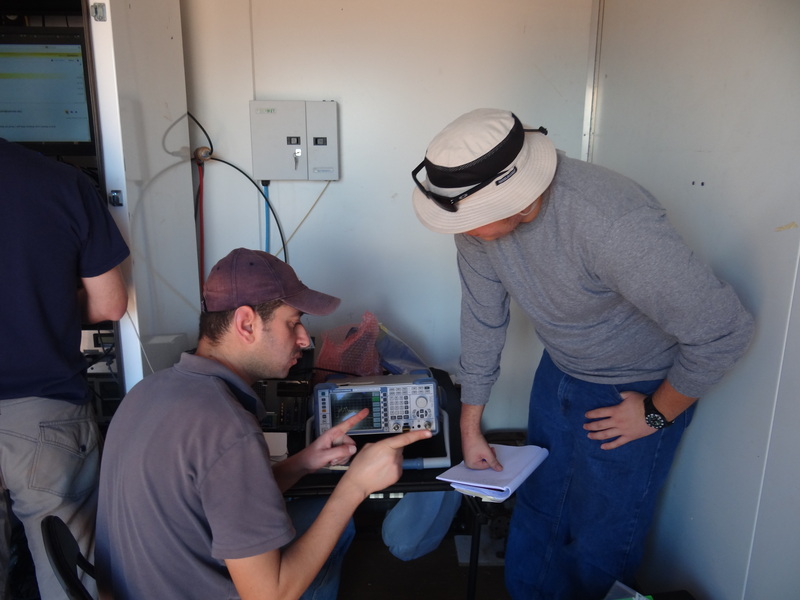 Rather than risk moving the antenna again, we constructed a makeshift lab in the outdoor desert so we could solder the joint in place. Hamdi promptly began soldering in a meditative style that would have made his yoga instructor proud. 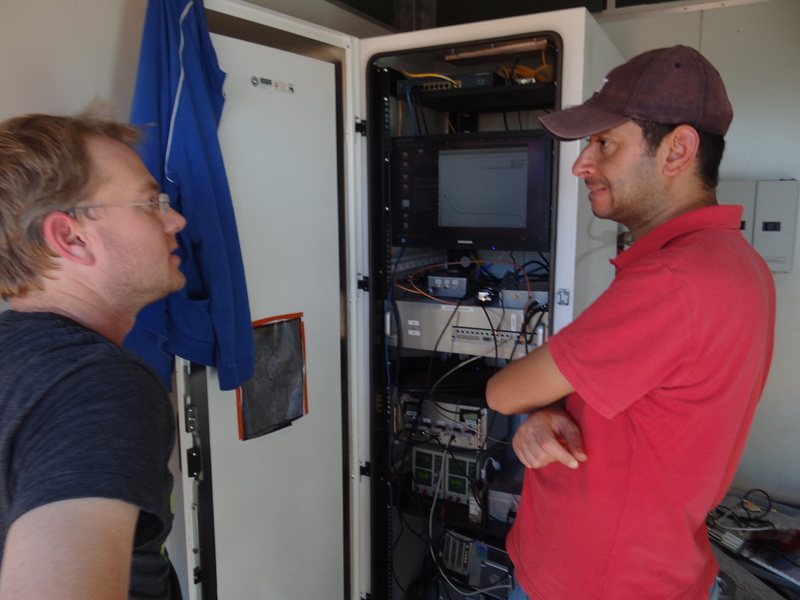 Once the terminal issue was fixed, the team did a quick spectrum measurement from 1-300 MHz in the hut. We noticed that it looked considerably different. There was plenty of power from the sky! At first we thought the RFI look suspiciously low. Although we are in a RFI-low area, there is still a small trace of things that we should see in the spectrum – such as occasional Orbcomm transmissions at 137 MHz. After waiting a few minutes, we did indeed see these signals. It’s also nice to note that today has been considerably cooler than the previous days. The wind helped keep the flies away and the pristine clouds were very welcomed. 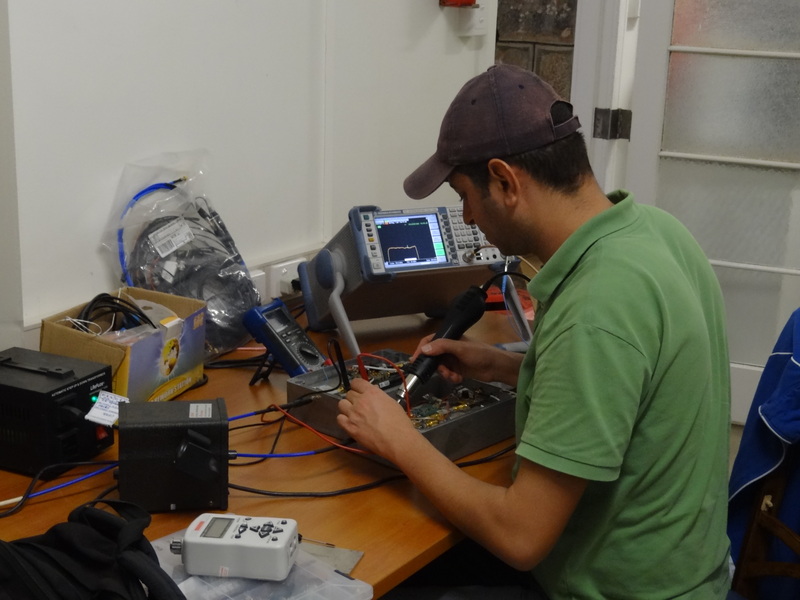 Hamdi proceeded on to taking a total power measurement. First with the antenna connected and then with the load. The input connection was connected to a splitter, which splits the signal in half. We then have to compensate for this by adding 3 dB to both signals. 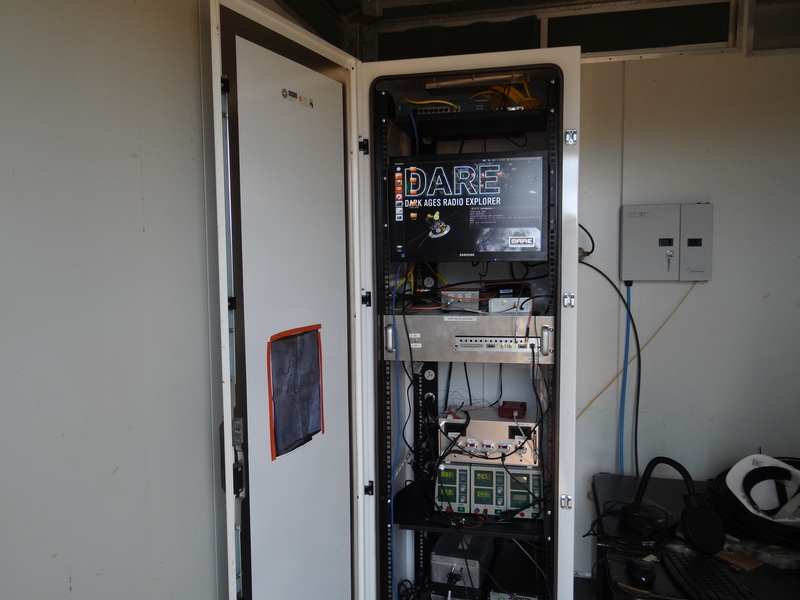 We recorded the total power produced by DARE when using the antenna to be -24.64 dBm and the load to be -28.46 dBm. With roughly half a day’s work already completed, we’ve analyzed some of data back in the control building. After a refueling lunch, we’ll go out again and wrap things up. After spending a few hours in the field continuing our efforts on DARE, we decided to take a break, or rather a “smoko” in the local slang. Normally referring a smoke or tea break, the team bent the meaning to imply a rest from work (maybe some tea). On a related note, Hamdi’s new rap name is “Smoko Loco”. We have yet to see if the name will launch the aspiring rap artist to super-stardom. Stay tuned. Nearby the EDGES/DARE site there is a control building that has a well-equipped lab in addition to some other amenities that one would find on a campus research building. Along with having a kitchenette and conference room, it also has a designated First-Aid base and a highly monitored wing with dozens of (yet to be) servers. 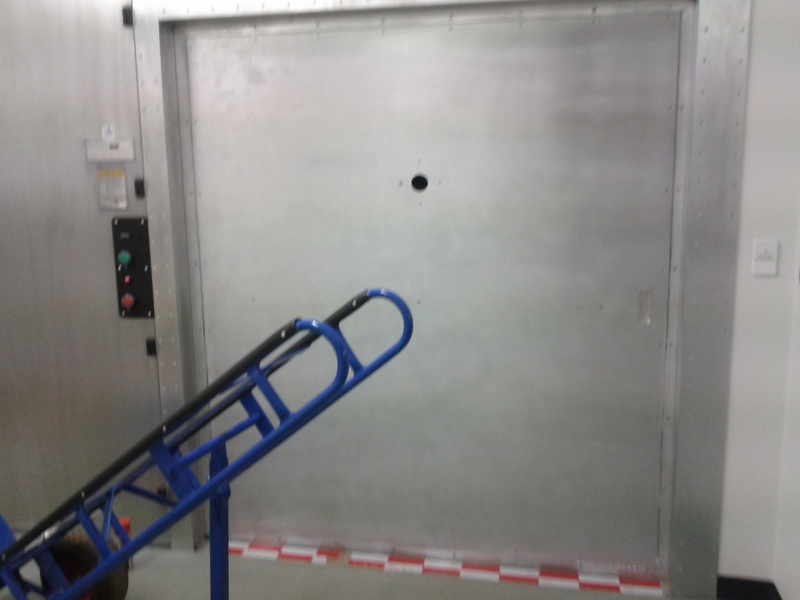 In order to prevent any RFI (Radio Frequency Interference), the building is protected by two pairs of pneumatic doors. This makes the building an impenetrable and impermeable signal fortress. 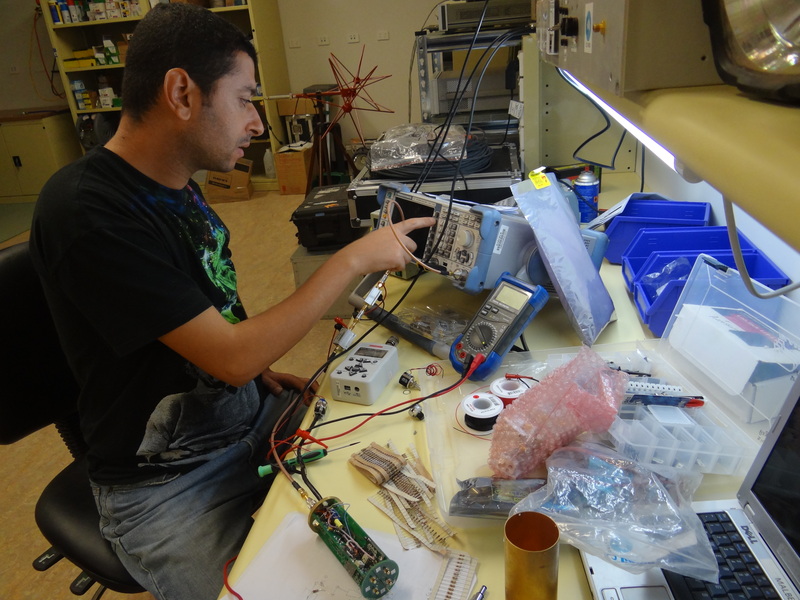 Hamdi continued working on the system in the lab inside, seemingly running off infinite energy. After a few tests, he alerted us by calling out, “I found the problem! It’s alive!”, referring to the balun unit. The unit was difficult to measure, but by boosting the signal we were able to spot it on the spectrum analyzer. As the team discussed during the lunch break, unraveling low-frequency radio electronics is not a simple task. For instance, to use commercially available equipment we must use a single-ended component. The team uses balun circuits to transform this to a differential (or vice versa). Test equipment we have on site does not measure differential circuits directly. This means we need to use some tricks. Likewise, faint signals provide a problem which requires highly sensitive equipment. In the end we measured the gain of the balun at 14 dB with an open load. That sounded about right, so we were ready to reinstall the balun and the antenna. 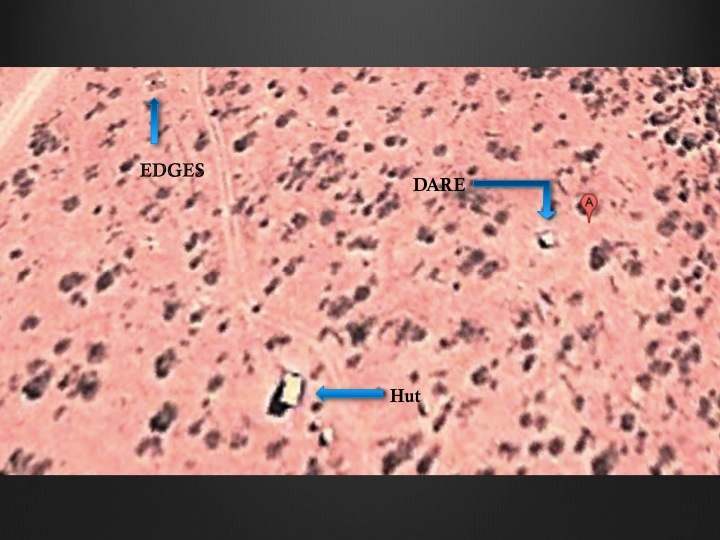 Refueled and regrouped, the team launched off from the control building and back to DARE. The winds had beefed up considerably in the afternoon, which made housing and rearranging the somewhat fragile DARE biconical antenna worrying. So we decided to postpone until the morning. 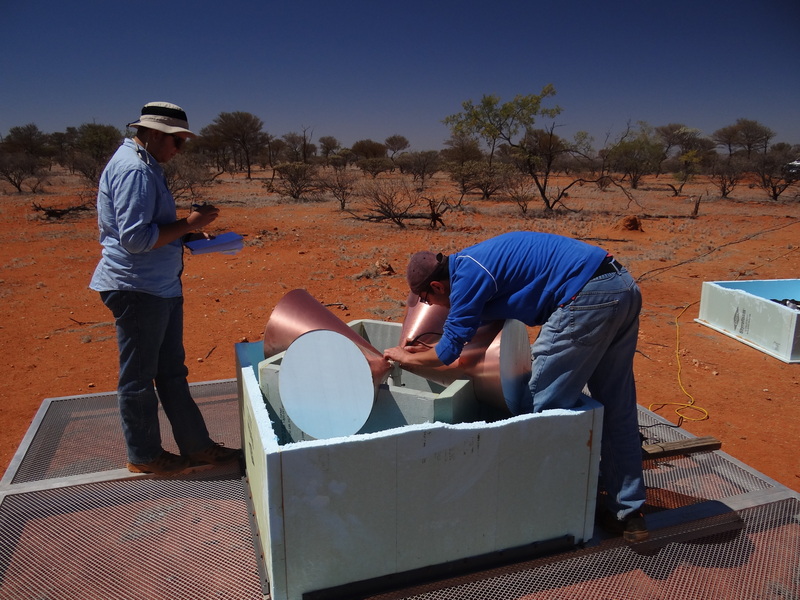 Comfortable with a good day’s work, the team used the hut as a temporary home for the antenna and strapped down the foam enclosure. 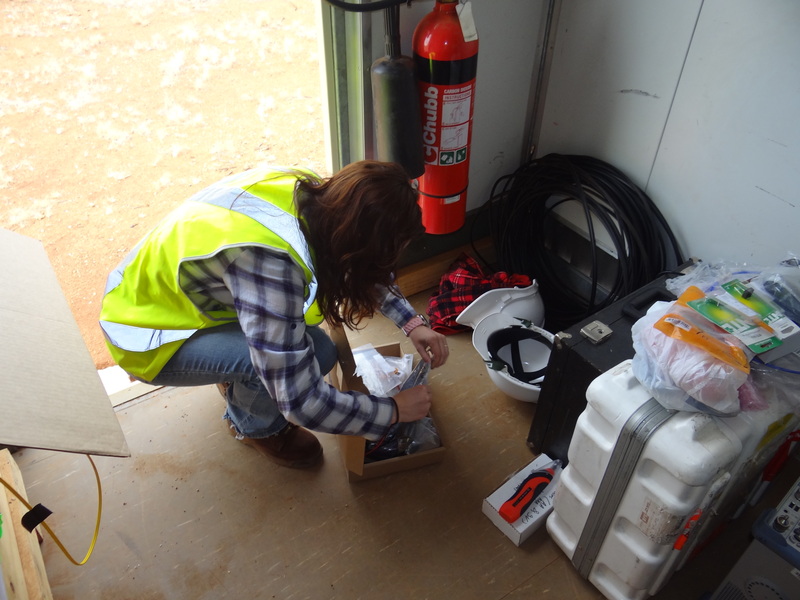 All in all, the team managed to solve a few issues – technical and logistical, alike. We checked the DARE low noise amplifier, learned how to best arrange our day, and many other things that will help out as a whole. The team definitely felt more confident after today’s work. I do have to add that being here reminds me of my childhood summers in Mexico; a foil between scientific investigation and the rugged rancher lifestyle. The people are both relaxed and excited about spending time at Boolardy (or rather Ball-ah-dee) Station. It’s a great place to do research and meet pleasant people. On the second day of our problem solving expedition, we began our morning earlier than usual. Given that we had arrived to the site pretty late the day before, we wanted more time to address the problems. We were ready to rock ‘n’ roll, or as Hamdi put it “roll ‘n’ rock”! 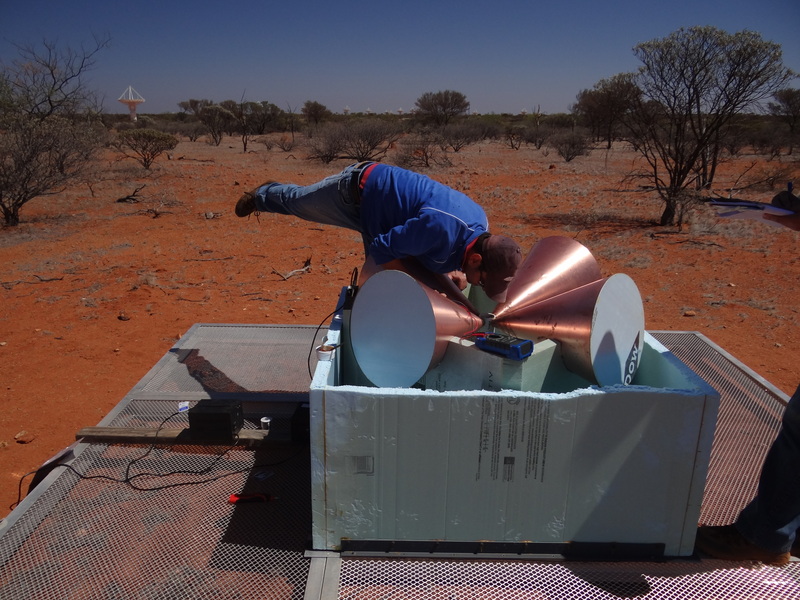 It took us longer than expected to get going from the Boolardy Station this morning because Hamdi was repeatedly examining the EDGES receiver unit while continuously saying “just one more thing”. It’s important to note how easy it is to lose track of time when you’re thoroughly focused on finding a problem. There was some bouncing of ideas on the way to site, which ended in Hamdi betting his lunch that the problem was related to temperature. We promptly arrived to the site once again, primarily focusing our attention to DARE. The method of attack was use metal plates (that had a previous life of being cabinet dividers) to pry open the DARE enclosure. Unfortunately, this didn’t work as we had hoped. Given few options left, we finally went with the contingency plan of cutting the top off the DARE enclosure. 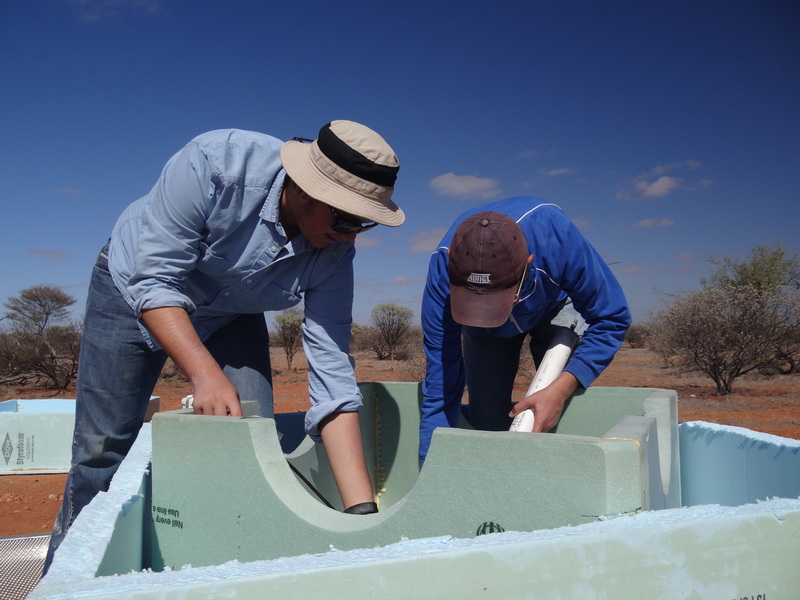 With an image from a prior trip of how the antenna was positioned inside the enclosure, the team carefully made some horizontal incisions across the foam and raised the top portion of the box, opening the system for inspection. Tragically, a spider was injured during this process – we hope that it is doing well. Before we altered anything, Hamdi made sure to take a spectrum sample to use for later references – like yesterday, it’s always important to record what happens before you change the system. 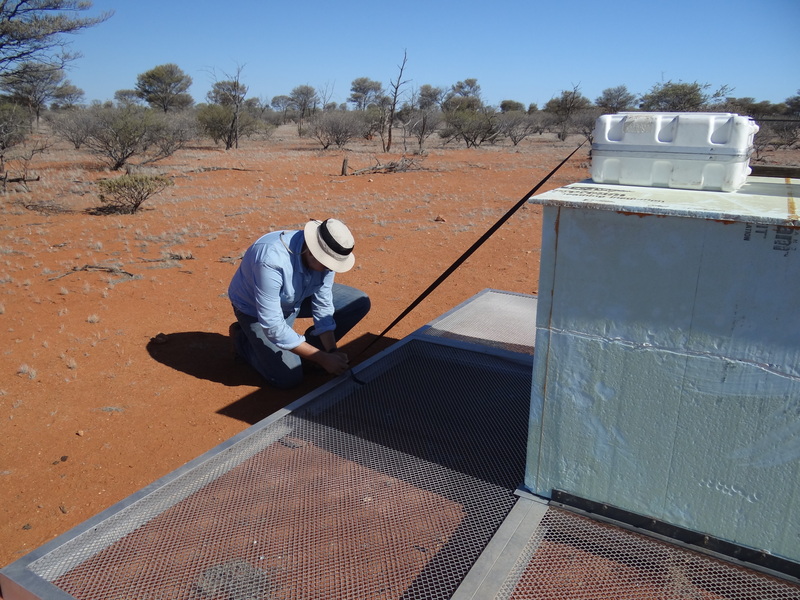 Nostalgically remembering his time working in Goldstone Observatory, Hamdi expressed that he was excited to be tackling this problem despite the pestering flies and steady heat. 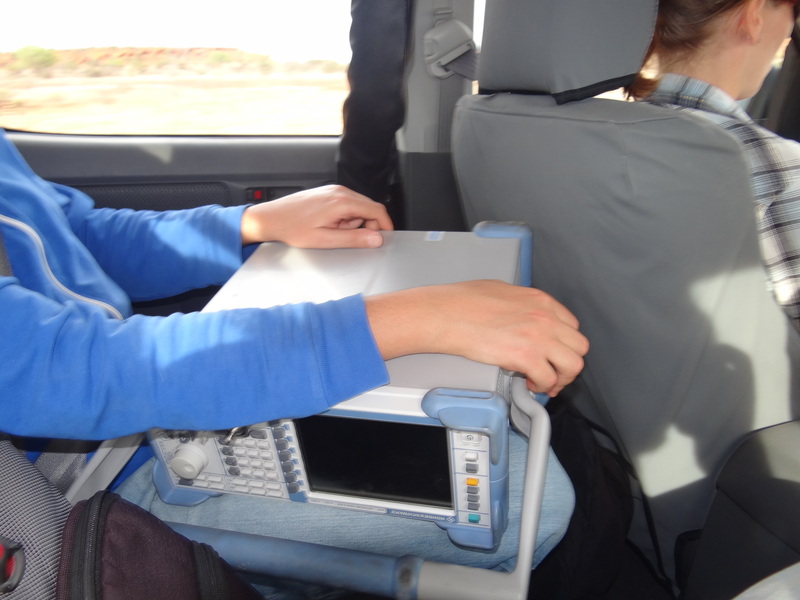 With a spectrum established from 1 to 200 MHz, the team expected to find a change in the amplitude of the signals. We then proceeded to examine the antenna itself. We also used a total power meter to measure the power connected and disconnected to the antenna. With less sun but more flies, our second day has produced a bit more results than the first. The fieldwork here has proven to be substantial but we realize that all the efforts ultimately turn into both fun and challenging experiences. After a +14 hour flight across the Pacific Ocean, another flight across the entire Australian continent, and an 8 hour drive north of Perth to Boolardy Station– it’s been one heck of a ride. 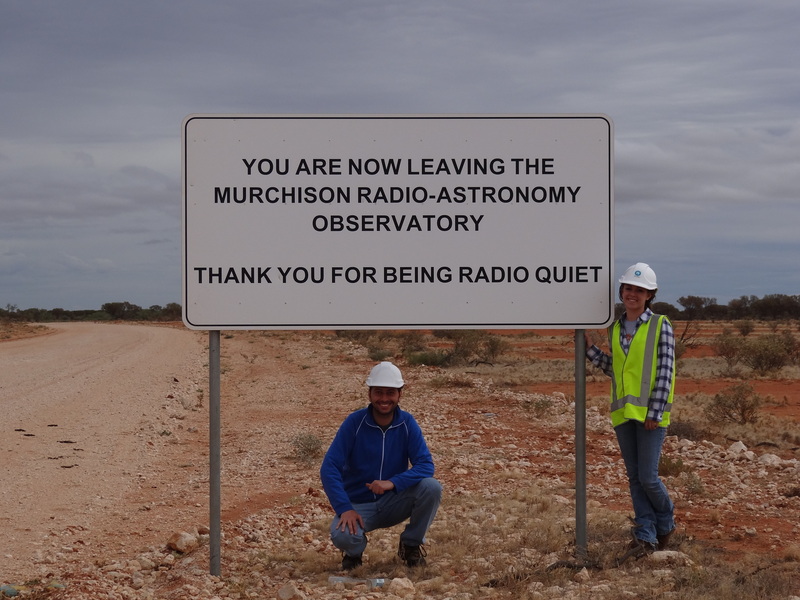 After a good night’s rest and a delicious meat-lover’s breakfast, we were on our way to the Murchison Radio Observatory (MRO) site. Only a half-hour drive from Boolardy Station, the site is 41 km away from our home base. 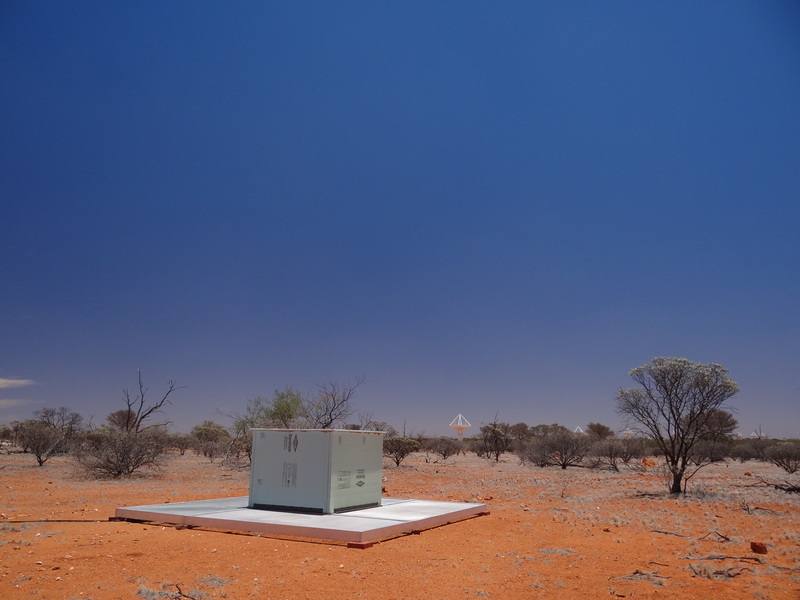 Along with being the home of the EDGES and DARE projects, it also hosts the Australian Square Kilometer Array Precursor (ASKAP). This array consists of numerous mushroom-looking dish satellites that provide for great scenery while we snaked through the small dirt roads. Once we arrived to the EDGES/DARE site, we immediately went to inspect the hut that holds the electronics and computers. 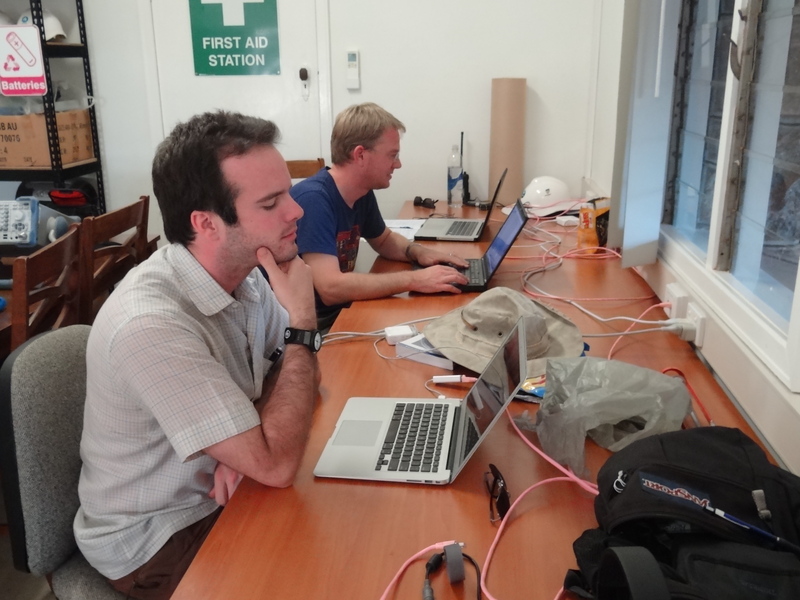 The team had arranged this trip to hunt down the reason why EDGES and DARE had been producing some buggy data. The weather was reminiscent of the Arizona summer heat. Cloudless, dry, and with the omnipresent sun shinning down with all of its power. 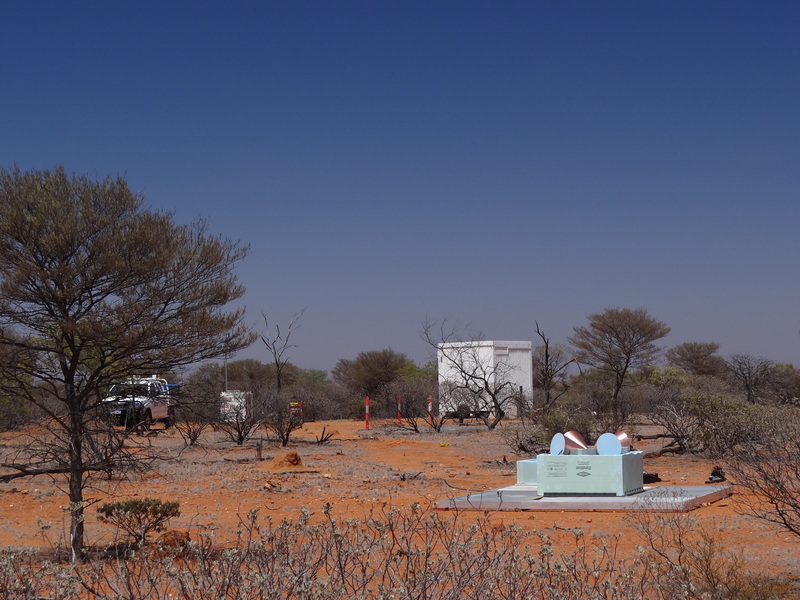 Without the shrubs, the terrain seemed that of the Martian surface – colonized by the various huts and buildings that the CSIRO had established. The first order of business was to set take a spectra of the antenna with our (handy) spectrum analyzer. This is done to establish a baseline of the signal distribution, which is used to compare with later samples. By using the process of elimination, we go through the wiring as well as the RF chain to see what would cause the larger problem. Since the issue is intermittent, which is to say that it occurs sporadically, it is quite challenging to find the culprit that is damaging the data quality. In order to prevent the weather from damaging the DARE system, it was housed in a foam box. We needed to remove the outer part of the box and, while seeming rather easy to do, this proved to be quite a challenging problem so solve. The team tried to remove the L-brackets without damaging the foam but the foam on the bottom edge seemed like it had melted on the bottom plate and was consequently too strong to remove. A few methods were tried but in the end we were not able to remove the box without damaging the sides. After we tried everything that appeared to be the simplest ways to remove structure, we decided to regroup and attack the problem again tomorrow with some different tools and during a cooler part of the day. In an equal but opposite contrast, the food at the station was quite amazing. Not unlike the cuisine one would find at a fine restaurant – it was something to keep our day on a positive note. Dinner was lamb braised with fresh fava beans over couscous, roasted vegetable salad, and something called “lemon delicious” for dessert. Although at many times this day might have appeared as an uphill battle, we learned a lot about what things to do differently. In science, it’s equally important to know why things don’t work just as much as why they do. 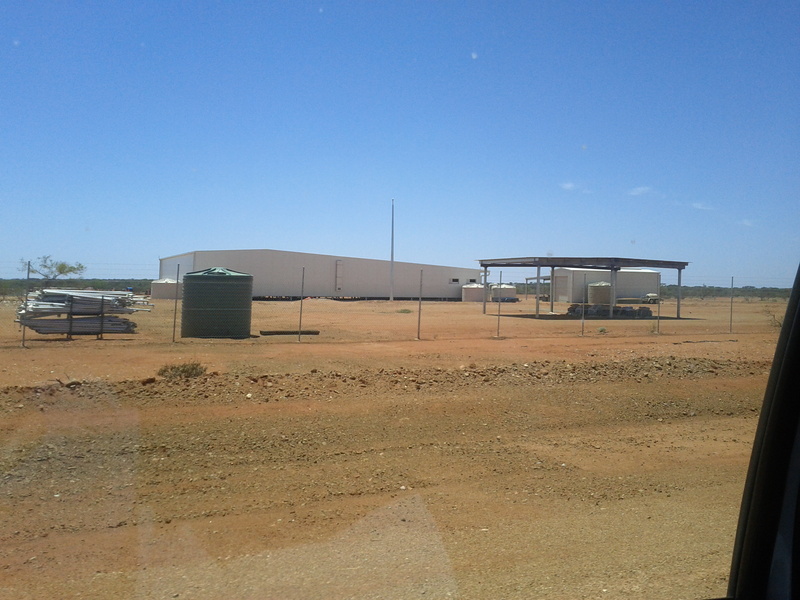 Today was our last day on site here at the MRO in Western Australia! We started the morning again bright and early at 5:30am with a delicious breakfast. Then we had a short telephone conference (yay modern technology!) with Dr. Rich Bradley (NRAO/UVA) who built the antenna. We were inquiring about the response of the system to low frequency signals the antenna was picking up. Once we had an idea of what we needed to look at when we got to the site, we headed out. We started at the site by tidying our little hut up. A lot of the electronics and tools that we brought with us were meant to stay here in Australia, but we had to go through everything to figure out what was staying and what was being packed. After going through everything and making a nice inventory of what was remaining here in Australia, we put everything in organized boxes and either stored them in the hut or put them in the car. Once everything was organized, we began our final system tests that we had planned on doing after our telephone conference this morning. We did our tests with the spectrum analyzer and determined that in order to the get the best data, we need to add a high pass filter that should get rid of a bit of the lower frequencies that are complicating the observations. Judd checking our handy work. 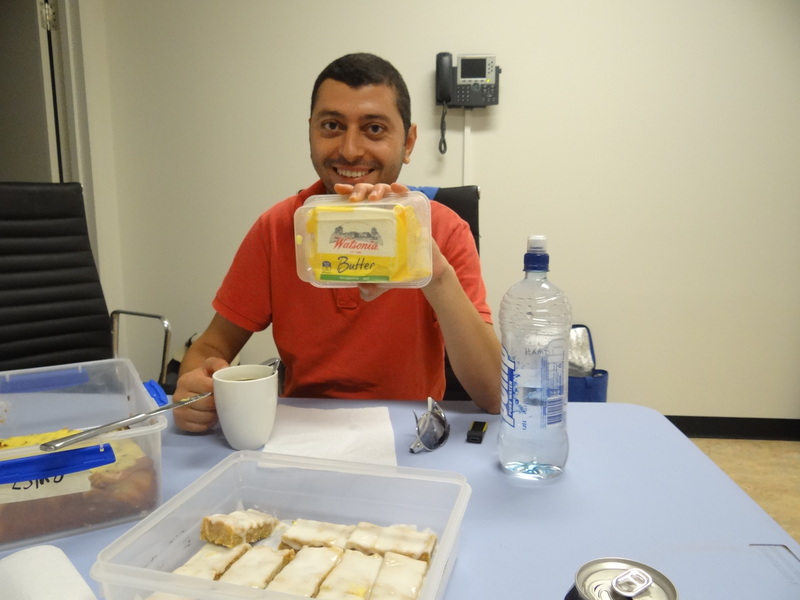 During lunch, Judd and Hamdi discussed the possible ways of making a filter here in Australia, but for quality and reliability, we decided we will ship the filter once we get home and have a staff member here at the MRO who is familiar with our system install it. 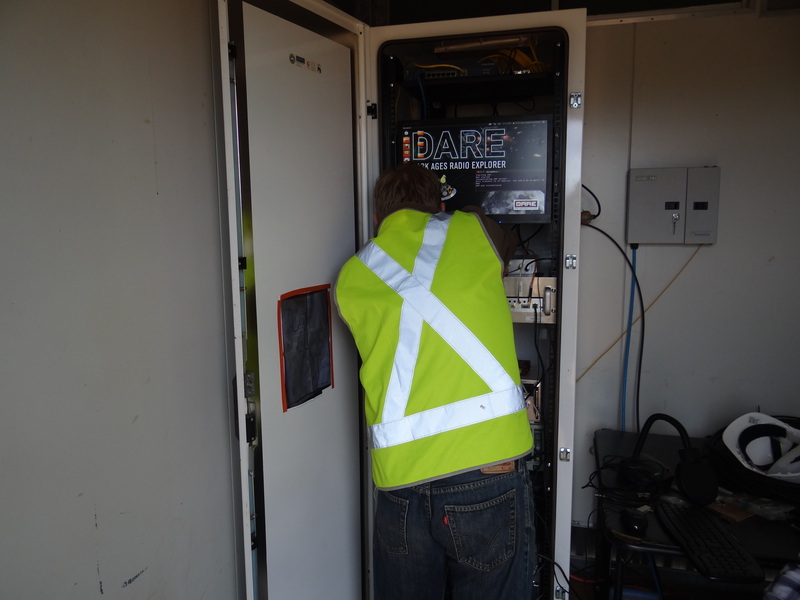 After this installation the DARE data will be fully functional and up for analysis! We are now back at the homestead doing laundry, packing our belongings, and relaxing after a hard week of work. 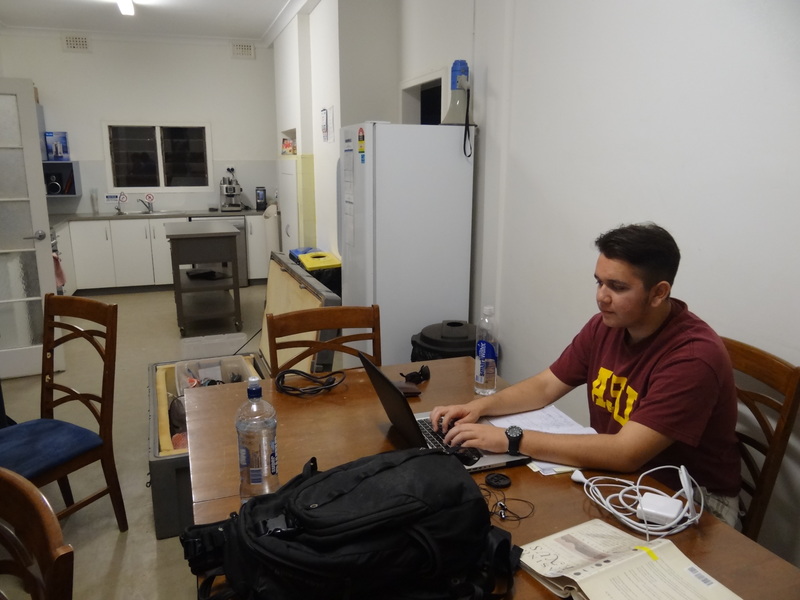 Judd is also preparing preliminary reports and data plots from all our efforts here in Australia. We will be up again tomorrow at the crack of dawn to start our long journey back to the US with our 8 hour drive back to Perth! We would also like to extend our thanks to all the people and staff here at the MRO and Boolardy Station. They were so hospitable and sociable; it made our stay here all the much more enjoyable. I would like to especially thank Barry, Michael, Shaun, Lou, and John specifically. They all helped us whenever we needed anything! Thanks!